First, a disclaimer: I count the author of this particular book as a friend, so you may of course (and probably rightly) suspect bias on my part. I promise you that I offer my honest opinions here on my blog, but since that opinion might be slanted a wee bit, I figured you should know. The play on words in the title of the book will appeal to parents, and the rhymed triplets inside the book will appeal to children, who have to guess the animal - a feat made fairly easy by the charming illustrations by illustrator Renée Graef. 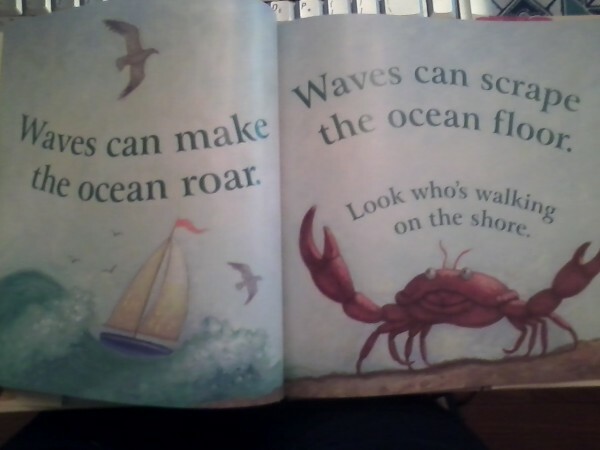 Waves can make the ocean roar. Waves can scrape the ocean floor. Look who's walking on the the shore. The book ends with a picture that incorporates most of the animals inside the book, all of whom are peering at the book or looking straight at the reader. The art is accompanied by a clever riddle written using two rhymed couplets. On the one hand, it gives the answer, and on the other, another answer is possible. is one who always loves to read. they're looking at? It must be YOU! A wonderful addition to the library of any young reader with a penchant for animals and/or a fondness for solving riddles - and a most excellent read-aloud. My thanks to the folks at Sleeping Bear Press for sending me a copy. It really is - perfect for the wee readers!